Next generation 1-DIN, USB and Spotify. Supports iPod/iPhone Direct Control & Android devices. Go with the flow. Go digital. Specifically designed for digital music, the MVH-S110UIG connects directly to your Apple or Android smartphone and other devices via the front USB or Aux-In. This way you can listen to your favourite tracks, while charging the battery. Or tune into one of 24 present digital FM radio stations for even more music playback. This short chassis stereo delivers 4 x 50W of pure MOSFET power and high-quality audio reproduction. 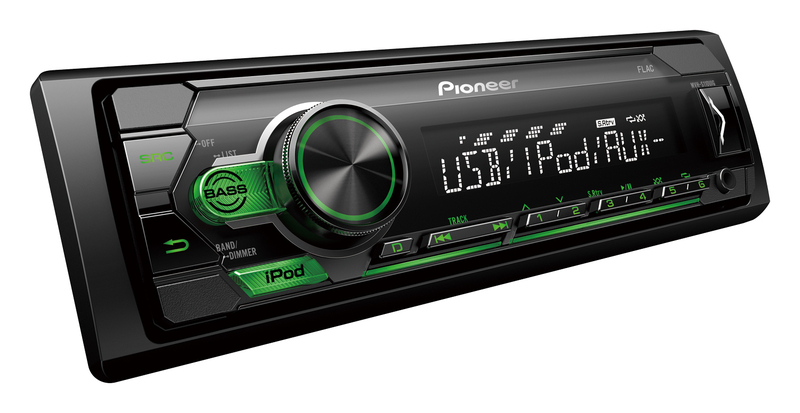 For additional power, it has 2 RCA outputs at the back of the unit, allowing you to install extra amplifiers and speakers.